Staircase Vastu Tips | Stairway | Steps: Staircase is the most important for any property to reach upstairs or first floor or upper floors, etc. Nowadays many residents used to install elevators or lifts to their home (home vastu). Elevator vastu is different and staircase vaastu is different. The elevator may require pit or hole or excavation on the floor, but the staircase does not require such pit or dig a sump. If there is any pit was coming in any direction that would be an effect on residents, as we discussed earlier on such pits. Some say that digging pit towards Northeast is very good, though it is right you should not install an elevator at Northeast, that would be the wrong placement. For more information, one may read this lift vastu link. 1. Northeast staircase is not at all good, it may harm the entire system of the vastu house. Please note that this point belongs to any direction homes, not for discussing staircase position at Northeast facing homes. If staircase kept at Northeast direction, then residents may suffer from many severe deceases or some serious ill health problems. Residents may get cancer attack when having a staircase at Northeast corner, some may lose their valuable opportunities, some times unexpected negative things may happen that we may not express like brain damage, lineage problem, etc. Please note that this would be happens based on the law of spreading, which we have invented this system and written at our website also. 2. The east direction is not good for the staircase. 3. Southeast is a good place for the staircase. 4. South is acceptable for the internal staircase. 5. Southwest direction is not suitable for the staircase. 6. West direction is suitable for the internal staircase. 7. Northwest is suitable for the staircase. 8. North direction is not suitable for the staircase. 1. Northeast is not at all suitable for an external staircase. 2. East is not a suitable placement for the staircase. 4. South is suitable for certain conditions. 5. Southwest is suitable for an external staircase. External Southern Southwest staircase for South facing homes and Western Southwest for West facing homes, it is acceptable. 6. West is suitable for certain conditions. As we discussed earlier that each and every part of the house is having its own discretion in vastu shastra, as usual, this staircase is also having its own judgment in this science of vaasthu, an Indian traditional construction system. These staircases are called with different names in different places like rung, shed, stairs, steps, sopana, metlu, setup of steps, etc. Let us discuss a system of staircase here before going to study the results of these stairs in the home. In olden days staircase means it has lots of weight and constructed with mountain rocks and they filled all these staircase steps from the starting point from the first step to the last step. In this system, this staircase has a lot of weight. Based on that our ancient rushis opinioned that it may harm when it planned at Northeast direction. Now staircase changed its style, structure, system, etc. Hard to swallow things took place in this staircase. 99.99% nobody construct the staircase with total rocks or bricks, except in a few villages. In ancient days this may be common construction but now construction system of the staircase was totally changed day by day. There is a lot of difference from olden days construction to present days stairs construction. Stairway, staircase, stairwell, stairs whatever the name may be staircase is with stairs or steps one two three . . . The Height, Level, Depth, Pitch, Shape, and run of the staircase are different from one and another. It means almost half of the feet or above half of the feet. If the riser in between step to step may be more than this 220 (0.72) millimeter then it may be difficult to regular climb/run on the steps. The standard staircase width may be 2.82152 i.e, 860 mm (millimeters). In some places, people generally arranging staircase from 30 inches to 42 inches based on the availability of a place and their convenience. But the standards are 2.82 feet. Based on design and spacious place one may increase the width of the stairs. The abrupt move of a flight of these stairs may not be more than 42°, if the stairs are more than this angle then it may be steep to climb comfortably, it may as well have a stepping stool/ladder than a staircase. Some people may plan to construct the staircase by 35°, it requires lots of space and climbing is also takes time to reach the upper floors, but this is very easier for the old people to climb stairs. More than 50° its tough to climb stairs. In between 39° to 45° is common and comfortable. 39° may take more space and 45° may fit in smaller areas. In between 45° to 50° degrees we may observe these kinds of staircases in many shops. Climbers handle the ramp rods and climbing the staircase in those shops. Generally, shops (shop vastu) may not have such a spacious space, based on the availability of space they are arranging their own style of stairs, somebody may arrange the stairs with 65° also. Different staircases are observed in some places like a straight staircase, Curve staircase, Spiral staircase and further, there may be some other L-shaped U-shaped T-shape. All types of staircases are not giving the same results, there is a difference in between stairs and results. 4. Metal staircase like steel, iron, aluminum, etc. If lightweight steel or iron or wood staircase was build in the houses then the above points which we discussed in this para may not be applicable. Please observe house vastu plans carefully before buying the home. For example, if in Northeast corner there is very light material steel and wooden stairs were framed then no need to worry and it may not cause severe damages to the residents though Northeast is not a good location and advisable to plan the staircase. The width, weight, tall, shape also relevant consideration when discussing results of the staircase. Likewise, we should be particularly observed each and every part in vasthu and then only come for the decisions. If the staircase prepared with heavy material, then at any cost don't plan it at North or East or Northeast. If in case, any resident conditionally requires staircase only at Northeast, then they may build it with holo wooden staircase or any other lightweight material. If the staircase may be towards east direction and that too coming into Northeast-east quadrant then the residents would suffer bad name and their works cannot go smooth, suffers with health decreases (content from www.subhavaastu.com), their expenditures are also very high even though they have good income, it may create many health disorders and other inconveniences. If placing staircase towards this area is inevitable then leave atleast 3 to 6 inches gap from East wall and thereafter plan for this staircase, it's so nice if you plan for lightweight materials than the concrete staircase in Northeast location. The best position for the staircase would be towards Southeast (Southeast direction house) (Agneya) and Northwest (Vayavya) for additional information you may check this Staircase Steps Vastu link. If the staircase is planning to construct at Southeast, then one has to make a portico towards East to Northeast and the same may be convenient to this Southeast staircase, if portico has not come towards northeast-east then it's possible that Eastern Southeast has extended. The same thing was shown in this staircase vastu link. So everything should be properly observed and then only plan accordingly. We also like to inform many more things in vastu forum soon. To minimize this Southeast extension bad effect, one may increase the Northeast-east with portico slab. Due to this NNE extension, the Southeast-east extension will be under the control. As you know that the southeast-east is the perfect place for the staircase for external locations. North Facing Home: Staircase may be best matched towards Northwest, one should not have a northeast staircase, it's totally wrong and dangerous to the inhabitants. There is no count for steps in the staircase, you can plan for any number of steps as per your requirement and convenience. In some places even some vastu expert also saying that there should only even number of the staircase, the odd number is not good. Just like they count the first step as Laabham (Profit) the second one is Nastam (Loss), likewise, they will start counting and reached the floor and it has to stop for profit only if it stops for loss, then they planned for another dupe step adding to the staircase. In one mobile shop, they followed this dupe (arranged another step only for the vastu purpose) step system and two customers fall down, It was a lot of confrontation, thereafter they removed the dupe step from the staircase. It is very good to follow architectural vastu guidelines but it is not a good practice to follow superstitions. It is not a good idea to arrange an internal staircase anywhere in the Northeast room. Suppose a linear staircase is designed either inside the house or outside the house. Then it should be from east to west or north to south. Then it may take any direction. The first step should start from North or East only. When resident planning eastern-southeast staircase, then the staircase should not touch the east compound wall. If inhabitant planning the northern-northwest staircase then the staircase should not touch the north compound wall. The staircase should proceed from North to South only, it should not start from South direction. The staircase should proceed from East to West only, it should not start from the West. Thereafter it leads to the first floor in an exalted position. When planning to alter the staircase at your house only because of vastu shastra then best to approach one vastu consultant. Further in continuation of the above point, if the staircase came towards East of Southeast part then the entire home may look to be Southeast extension, this is not a good feature. To minimize this substandard consequence salutary to arrange one portico at Northeast-east. The portico should more towards the east direction than this Southeast-east staircase. This is a good remedy for Southeast extension. Attaining to Northwest staircase the same regularity may be referred. Due to constructing of this Northwest staircase the entire home should look like a Northwest extension home. So better to plan for Northeast-north portico and should be more than that of this Northwest staircase. This is a good remedy for the northwest extension to the home. If your home is west facing house and you are planning to construct outside staircase you are not supposed to construct towards western northwest part, the staircase has to be constructed towards the southwest only. Regarding South facing property, the staircase should not be planned at southern southeast. The good ideal place is southern southwest location. If one property may have a southern southeast staircase and may have a main entrance door towards Southwest-south, it may curse the residents with many diseases and financial collapse. Some times it took long to get the bad results, if the staircase may construct with the concrete system. Residents are advised to place the main entrance door towards or South direction or southeast-south. Some homes may have a staircase at outside very lengthy and crossed the borders of the home, this is not good practice. In some places, we observed the Northeast staircase also giving good results. For example, there is two story building, the staircase came at the Northeast corner. With this position, the ground floor people suffer from bad ailments and whereas the first-floor people enjoy their life with this structure. How funny it is. So residents should always care about vastu principles. There are lots of computations, calculations, divination, prognostications and logic in this vastu shastra, that is why many vastu experts never respond to the client's questions, they require to check personally of such property, otherwise, the exact facts cannot come out. Somebody requires to have a toilet or bathroom under the staircase, in this case first one has to check where is the staircase in their home. For example, if the staircase is towards eastern southeast and constructed outer side then residents plan to construct a toilet under the staircase, in this case, the Southeast may be extended than the Northeast particularly the home plinth area, not the compound premises. To balance this defect resident may extend the eastern Northeast through portico then the Southeast extension problem will be solved. For Northeast facing homes the suitable place for outside staircase is the northern-northwest, if there is a staircase at outside and it was built at Northwest and residents now requires to build the toilet under this staircase, then it seems to be the Northwest will extend than the Northeast, at this moment, resident may extend the Northeast part than this Northwest, it's very simple, the problem solved. For South facing home, we never recommend toilets under the staircase if the staircase was built at Southwest or Southeast or even at South direction. Constructing a room under this staircase is not recommended. If you are planning to construct the room under the staircase then it should not touch the main building. For West Facing home, never recommend toilets under the staircase if the staircase was built at Southwest or Northwest or even at West direction. Constructing a room under this staircase is not recommended. If so the southwest becomes lower than the entire home. Lower southwest causes many disastrous circumstances to the homeowners. Let us know what is your questions on the staircase, we will try our level best to answer here. What are all vastu effects? Hotel vastu, is vastu applies for hotels? Vastu consultant in Houston, need vastu advice? Apartment vastu, is vastu necessary for apartments? How the things works in USA in terms of Home Vastu? Which area part of Kitchen is suitable for Sink and Stove? We are always facing court cases, what reasons behind it? Can we directly install doors to the wall corner or need pad? Is tilted or inclination sites are not auspicious for happy life? Regarding western commode, which part of toilet is suitable? Where to sleep, where to keep our head while sleeping in bedroom? Dear Sir, we are going to construct a house and built staircase at the southeast corner with lift please suggest me my house is south facing. Can we build the staircase with an elevator? Dear Sir, my plot is south facing, I have plot size ie 80/60 plot construction made in 60/15 size i.e., I have left open towards north-east, sir, I have constructed south-east gate & steps starts from anticlockwise direction starts from north and touch to south wall it is build after S-E entrance gate is staircase is built. 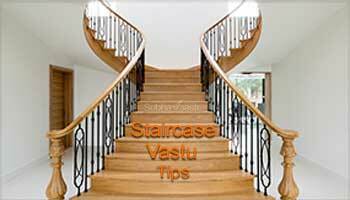 Looking to get staircase vastu tips in Hindi language. Please provide complete dosh nivaran and many remedies on this vastu website.